Got zucchini? The common answer to that question this time of year is yes…then comes the question, “what else can I do with it?” I thought you’d never ask. 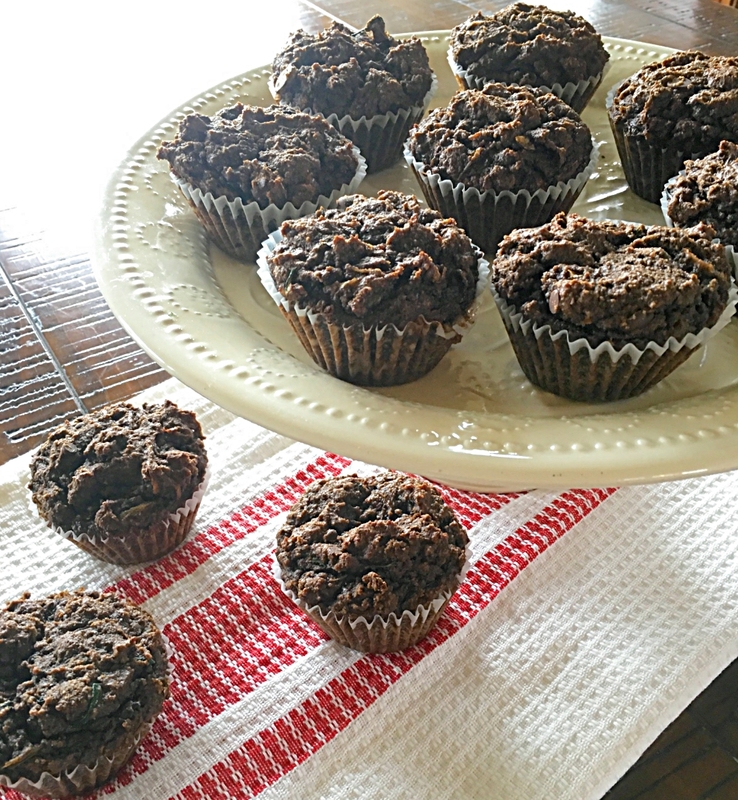 Here is a zucchini recipe round up full of my favorites that include salads, zucchini patties, lo mein and chocolate muffins. These family friendly recipes are all grain, dairy, refined sugar free and super delicious. Other favorite zucchini recipes in my archives include low carb Zucchini Pizza Crust, Zoodles Red Curry Bowl with Cod, and Zoodle Sausage Soup. 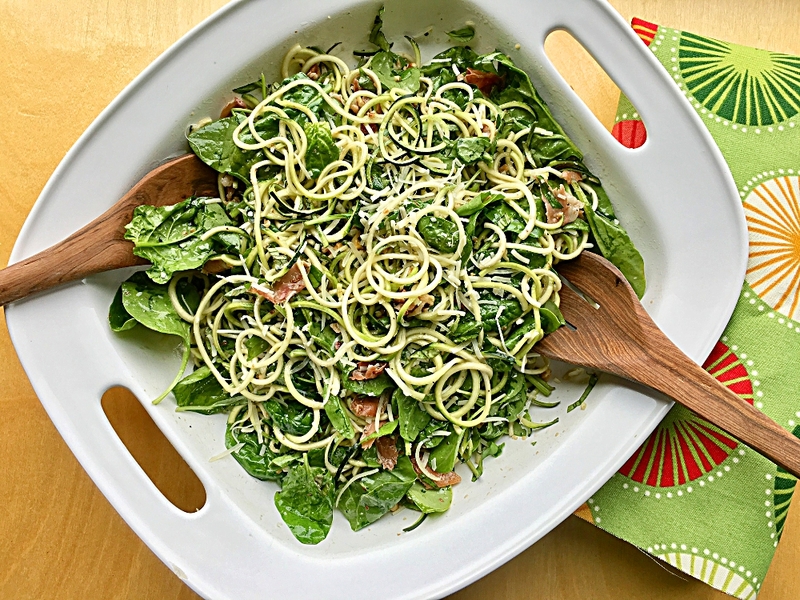 To make zucchini into noodles (zoodles) I use the paderno 3 blade spiralizer. There are other excellent spiralizers on the market including OXO brand and the Inspiralizer. They are all available on Amazon. Okay..let’s get on with these recipes. Then I’m off to make some of those yummy chocolate muffins (last recipe ⇓) with an over done zucchini I found in the garden. Place zucchini noodles in a large bowl. With kitchen scissors, cut through the strands to trim noodles. Toss in spinach leaves and prepped basil. Set aside. Heat walnut oil in a large skillet on medium heat. Add the garlic. Saute and stir for 2 minutes until garlic softens and starts to brown. Add the prosciutto, stirring to bring the meat to a crisp. This should take 1 – 2 minutes. Add the vinegar, salt, and red pepper flakes and bring to a simmer. Remove from heat. Pour warm vinaigrette over zucchini noodles, and spinach mixture. Toss well. Arrange salad on a serving platter. Sprinkle with parmesan cheese and chopped toasted walnuts. Serve soon after it’s dressed. * To roast walnuts: preheat oven to 350 degrees. Spread walnuts on a baking sheet and place in 350 degree oven on middle rack. Set timer for 8 minutes. If walnuts are done, they will have a wonderful fragrant smell and have a slightly golden color. If not done yet, give them another 2 minutes. They burn easily so err on the side of caution. finely chopped scallions or cilantro for garnish. Directions: Line a large colander with a few layers of paper towels. 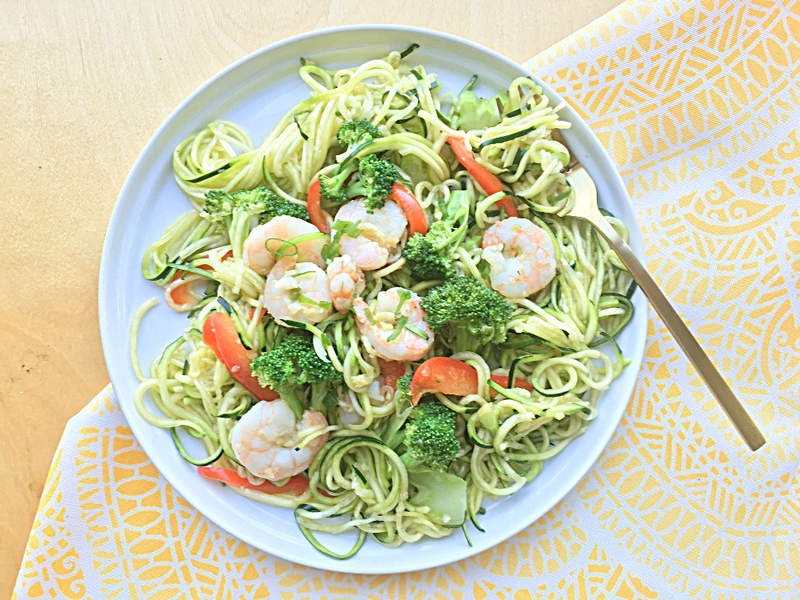 Place zucchini noodles in lined colander and trim noodles by snipping here and there with kitchen shears. Toss noodles with 1/2 teaspoon of sea salt and allow to sit while cooking the stir fry. Heat a large skillet over medium heat. Add 1 tablespoon of olive oil then add half of each the scallions, ginger and garlic. Season with salt and pepper. Stir-fry until the scallions are wilted, 1 to 2 minutes. Add the shrimp and stir fry until just cooked through, about 5 minutes. Transfer the shrimp mixture to a plate using a slotted spoon. Heat the remaining 1 tablespoon of olive oil on medium heat using the same skillet. Add the remaining scallions, ginger and garlic; stir fry 1 to 2 minutes, then add red pepper and broccoli. Toss to coat vegetables while keeping the heat on medium. Add 1/2 teaspoon sea salt, and a 1/2 cup of the broth. Cover, bring to a simmer, and turn heat to medium – low. Cook until the broccoli is just tender about 5 to 7 minutes. Remove zucchini noodles from colander a handful at a time and wring out excess liquid into the sink. Place in a bowl and set aside. In a large bowl, whisk together the arrowroot and remaining 1/2 cup of broth, coconut amino’s and toasted sesame oil. Set aside. Return the shrimp to the skillet with the broth mixture. Bring to a simmer and cook while stirring until mixture thickens. Add zucchini noodles, mixing gently. Cook just a few more minutes to warm the noodles. Remove from stove. Serve topped with finely chopped scallions or cilantro for garnish. In a medium sized bowl combine almond and coconut flours, arrowroot powder, cocoa powder, baking powder, baking soda and sea salt. Mix well, then rub between hands to break up lumps until mixture is smooth. In another bowl place the ground chia seeds and warm water. Whisk together immediately to keep the chia seeds from clumping up. Whisk in the eggs, oil, coconut sugar, grated zucchini and vanilla. Combine the liquid and flour mixture together and mix well. Stir in the chocolate chips. Line muffin tin with liners. Distribute batter evenly into muffin cups. Bake for 30 minutes or until toothpick inserted comes out clean. Let cool in muffin tin on wire rack for 15 minutes, or longer. These freeze well. For those of you who have never tried Amy’s Red Curry Zoodles with Cod, it’s a must!! Sometimes, I substitute salmon for a change. I won’t be making any of this until the temp drops, but can’t wait to try the muffins. Thanks Amy for your continuous efforts to help us eat healthy. Hi Amy, Mona here I finally made the zuchinni pizza crust and love it so much that I have made up 7 crusts and froze them. It is so convenient and tasty. Yay! That’s so great Mona! What a great idea. Do you freeze them after they’re baked? 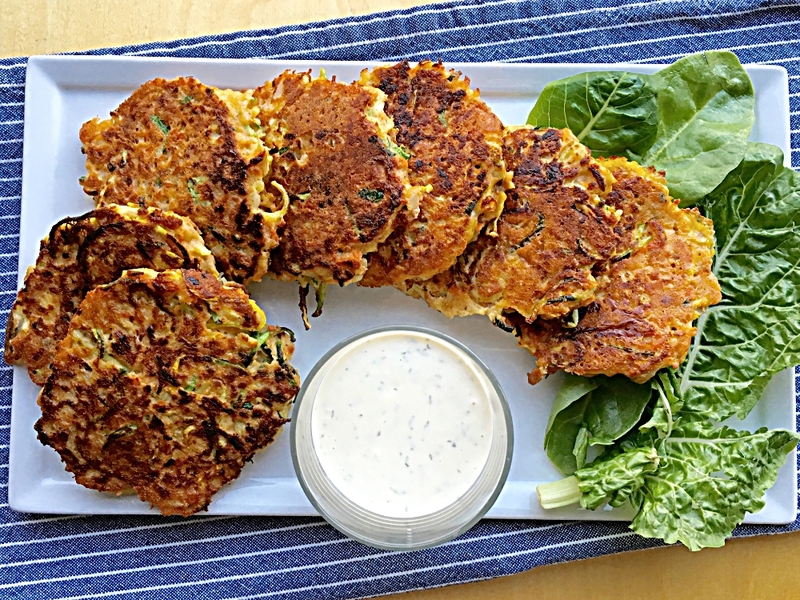 We just had the Pan Seared Zucchini Salmon Cakes last night for dinner. They were so delicious! I had leftover salmon to use up (as well as zucchini of course) and so I weighed the salmon I had and my batch of salmon cakes on how much salmon I had. It ended up being a recipe x 5! So now I have some in my freezer as well for another day. I’m so glad I do! Yum! Yummy Megan! I’ve successfully doubled the recipe to keep in the fridge for lunch the next day. You’re welcome! I hope you like them as much as we do Pam. They are on repeat around here! Me too! They are such a treat, right?